I recently pulled out my old mountain bike I purchased many years ago in Austin. It had been close to 7 years since I had rode the bike. Not once did I ride it in Atlanta, but after seeing all of the bikes on the road in Santa Monica, and having a great beach within minutes I decided it was time to give the bike a ride. About 8 weeks ago I took my first ride. On that first ride I simply made it to Ocean Park overlooking the PCH to the beach. I was exhausted and did the best I could to return home. Little did I know the ride down to the beach was all downhill and coming home it would be all up. After a few more weekends of riding I've been able to get a respectable routine down with a ride between 10-11 miles. 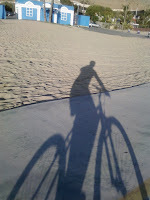 I now have a couple of routes, the first down to Venice beach and the second over to the Pacific Palisades area. It usually takes me about 30 minutes to get down to Venice. The reward of course is the people watching, from the skaters, to the dancing roller bladers, to the people playing basketball. And of course on a sunny Saturday you'll have large crowds of locals and tourists. The crowds sometimes make this a tough route to ride due to so many people walking, riding, skating, and shopping. So I've begun heading to the Palisades when the crowds are out. The second route heads North of Santa Monica to the Pacific Palisades area. I've only made this ride a couple of times and the last ride drained me. The elevation changes on the bike route are much more dramatic than the route to Venice. Once outside of the shopping district of the Pier there aren't many people on this path. Roller bladers and people on bicycles dominate this path. You can click the maps to see the path in detail.